Do you see yourself struggling more than your peers, colleagues, and friends? Maybe your palm lines can give you some insight. Life is all about working hard to achieve your needs, desires, and dreams; without the struggles we endure, we can never measure progress. While some people experience only minor periods in their life that seem difficult, others must struggle throughout to achieve even trivial things. Even the worlds richest and the happiest individuals might have gone through their fair share of hard times, but for some people, these hard times never seem to end. Do you ever wonder, or think about, how great it would be to know exactly how much more we have to go through? Or how long this period of struggles will last? Palmistry explains that every individual’s past, present, and future is written on their hands. They only need to focus, observe and learn. Just as your palms can tell you about your love life, health, and luck, it can also tell you about your struggles. 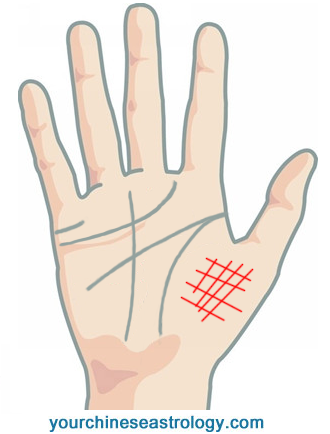 If a person has a lot of net-shaped patterns, or crisscross lines below their thumb, then it is an indication that they may have to work harder than most to achieve their goals. You will eventually get your desired results, but you will have to work twice as hard, sometimes even three times as hard, as those around you. Doubt might be a lingering effect, but rest assured- you will get there. A person whose life line is filled with a lot of cuts is a sign that, for them, struggles will show up early in their life. Throughout their 20s (early adult life) they will see themselves working hard, but not getting where they expected to be from all of that hard work. But, this doesn’t mean they won’t see the fruits of your labor heading your way. You’ll get them, but it will be much later in life.These people might even think of giving up under the extreme pressure of their struggle, but it will all be redeemed. Thankfully, your struggle won’t last for long. After 35-38 years of age, your difficult times will end. If your line of luck is divided into two, but later eventually meet, that is a sign of a deep emotional struggle in life. You will have to put extra efforts into everything you do to- always. There is good news however: when you reap the rewards of your hard work, it will be much more than you ever expected. In this way, you are very lucky.